The District Public Image committee works closely with RI Public Image Co-ordinators and the RIBI Public Image committe in order to co-ordinate the implementation of RI and RIBI strategies and to provide resources, guidance and support to clubs in our District. During this Rotary year the Public Image committe along with Membership will be working and developing joint programmes and events for clubs in our district. Public Image committee are responsible for the publication of the new outward facing District newspaper "Rotary News" published bi-monthly and supported by a "Rotary News" website, facebook page and twitter account and also available online as an electronic copy. 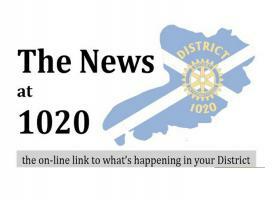 It's YOUR Rotary and District, Public Image and RIBI need YOUR HELP to keep everyone informed and up to date with what’s happening in our District. Available to purchase via the RotaryGBI Shop / online catalogue or direct from Rotary's preferred supplier "RotaStore" are a range of Rotary promotional items to help District and Clubs raise awareness of Rotary and promote the Rotary name, brand and image. If your looking for items to promote Rotary at an upcoming Event? Look no further than "RotaStore", Rotary's preferred supplier and independent non-profit making web store run by Rotarians for Rotarians who are here to help. There is a huge variety of items available in every price range from customizable Pull-ups, Banners, Pop-up Kiosks, Mark of Excellence, Gazebos, Trailers and much more, all designed to make a lasting impact at any event. Please click here to view all items available for purchase (the store will open in a new window) . 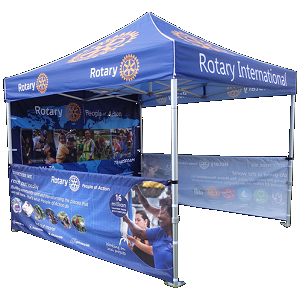 Each area now has its own Rotary Gazebo, to really stand out at events. For a professional impact this quality Portable Pop Up Gazebo is convenient for any shows, exhibitions and promotion purposes. Easily erected by one or more persons and when collapsed down fits in a storage bag for easy transport. The Full Size Backwall is double-sided and fastened to the top of the frame leg via velcro and then secured down each leg of the frame by velcro straps. This Backwall can be assembled onto any side of the canopy. Height Setting: Five different heights ranging from 3.2m (10.5ft) to 3.4m (11.25ft) tall. Frame: 50mm Hexagonal Telescopic legs which snap into place. Basically, we can create a PR package tailored to be used by clubs within each Area for both indoor and outdoor events, with the option to split the cost amongst those that wish to contribute to such a resource. Should clubs wish to discuss further please go through your Assistant Governor I will be only too happy to assist with a quotation.